Last December 9, 2015 a CSP-Conlutas (Brazilian labor and people’s federation) delegation left from Sao Paulo to Dourados (Mato Grosso do Sul state) to stand in solidarity to the Guarani-Kaiowas. The main aim is to get in touch to their daily life and to bring awareness about their struggle for official recognition of their lands. According to the Indigenous Missionary Council (CIMI), a body linked to the Catholic church, at least 390 Indians, including children, were killed only in Mato Grosso do Sul state along the last 12 years. Forty-one of them last year alone (2014). On top of murders, arson attacks, beatings, rapes of adult women and teenagers and psychological terror are employed by landowners in order to expel the Guarani-Kaiowas and take their land. "What happens in Mato Grosso do Sul state is a true genocide. The massacre suffered by this people is due to the greed of the big cattle ranchers, landowners and agribusiness in the area who do not respect indigenous lands and advance every day on these lands carrying out killings where necessary” says Paulo Barela from CSP-Conlutas leadership. Named “Tekoha Caravan”, this delegation will visit the Guarani-Kaiowas in four different sites during 3 days. 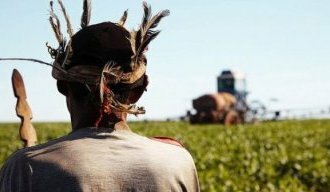 This initiative aims to contribute to the strengthening of native-Brazilians rights and to draw attention to their struggle in defense of indigenous land official recognition in Brazil. Another critical issue is to prevent PEC 215 from approval in national parliament. This bill benefits economic interests over both environment and land recognition for native-Brazilian and Blacks who descend from slaves. Tekoha Caravan (Holy Place Caravan in Guarani language) will be attended by representatives of both labor and people’s movements among them members of Andes-SN (Professors National Union), FNP (National Federation of Oil Workers), Sintusp (University of Sao Paulo Workers Union), Sintrajud (Sao Paulo Judiciary employees Union), MML (Movement Women in Struggle), ANEL (Free National Students’ Assembly), Quilombo Race and Class (Black movement) and Luta popular (homeless movement) among others.